My sister is a neurologist. She’s highly active in her field and is often asked by the media to comment about her particular area of expertise within the field of neurology. It is great having a sibling who is a medical doctor. Though she and I do technically both have the title “Doctor”, I have zero medical expertise, outside of some wilderness first aid, and maybe little random bits I’ve gleaned from various sports-related accidents and drinking the water in the wrong village during a field trip. When something medical comes up, I call my sister. She listens, humours me, and provides general advice. But if it is anything important, or that anything is not neurological, she tells me to see my family doctor, who is better equipped to either diagnosis and treat the ailment or refer me to a specialist who can. That’s the gist of today’s Wall Street Journal op-ed from 38 climate scientists, including myself. It was written in response to an earlier misleading op-ed about climate change by 16 scientists who were speaking far outside their field of expertise. There’s no compelling scientific argument for drastic action to ‘decarbonize’ the world’s economy”. It’s important to deconstruct that statement. Had the authors of that op-ed only argued against action to reduce greenhouse gas emissions, I would disagree with them, but not protest the publication of their op-ed. The difference, I would argue, is twofold. First, some of the signatories to the letter actually conduct research at the interface of science (diagnosis, in Revkin’s example) and policy (treatment). Second, we recommend a very general response to the diagnosis (reduce emissions) rather don’t prescribe a particular treatment. Certainly an X-ray technician, after seeing hundreds and hundreds of X-rays and working with doctors over the years, is justified in telling a patient “Hey, you should probably put some type of a cast on that broken leg”. I wondered about the same thing Revkin wondered about. I am not sure I really believe this "could also drive decades of economic growth". To be honest, as regulars will understand, I'm not sure I want that either. That said, you are far too easy on Revkin. His attempt to be evenhanded between your letter and the psychotic ravings of the 16 Lunatics is yet another example of the compulsive difference-splitting that makes the press so consistently useless. Most of the authors in both camps are scientists. Technically true, but as Simon points out that kind-of COMPLETELY misses the point. The simple fact is that not everyone's (not even every scientist's) opinion is equally valid. Expertise matters. And I have no idea why people like Revkin forget this simple uncontroversial fact far more often than is excusable. I agree with Simon's point that a *generic* treatment can be given, based on the science and of course on one's attitude towards risk. Just as a medical doctor can suggest a patient to stop smoking to protect their health. What the scientist-equivalent of a medical doctor should not do is to suggest a specific treatment ("you should take these nicotin patches"). It's a fine line to walk though. I would have chosen to end the piece a bit more open-ended, e.g. "Unabated CO2 emissions will very likely cause substantial climate change, with serious consequences. Society should decide its course of action in part based on this knowledge." Whether mitigation encourages economic growth is very debatable indeed, as mt noted. Afaik most studies suggest the contrary, but it depends very strongly on assumptions made (discount rate? (Lack of) Success of Efficiency measures?). Cost-benefit analyses are hugely uncertain, and as such one could pick any number one likes. Their use as I see it is more in providing insight into how our choices affect the cost-benefit picture. "That said, you are far too easy on Revkin. His attempt to be evenhanded between your letter and the psychotic ravings of the 16 Lunatics is yet another example of the compulsive difference-splitting that makes the press so consistently useless." My reaction as well. You have one letter that just uses factual inaccuracies and compares scientists to fraudulent murderers to make its point, and the other makes a simplistic analogy about expertise using dentists. Whether you agree completely with it is another question, but at least it was rational! How the hell is one supposed to make sense of this? People's guttural response and the way it which this has been reported, so far, just doesn't conforming to any reality. Revkin and now Kloor , need to ask themselves if their agreement with the title: "Don't Panic" (which is a strawman) is biasing their reporting on this, and debate overall. Useless is correct. "Cost-benefit analyses are hugely uncertain, and as such one could pick any number one likes. Their use as I see it is more in providing insight into how our choices affect the cost-benefit picture." The benefits of new technology may be hard to anticipate, while the comfort of the old technology is palpable. But regardless of exact numbers, is there real doubt (beyond the WSJ) on which side the benefit lies? Nordhous: "The piece completely misrepresented my work. My work has long taken the view that policies to slow global warming would have net economic benefits, in the trillion of dollars of present value." Or simply: is it better to "leave oil before it leaves us" or the opposite? Can we realistically expect journalists to inform and educate the public, when most of them believe the same silly things as the average idiot on the street? you ask: "is there real doubt (beyond the WSJ) on which side the benefit lies?" Economically speaking, and only taking into account things which are currently economically valued, there indeed is doubt (i.e. it strongly depends on assumptions made). Including other valuable issues besides those which enter in the typical economic cost-benefit analyses, the answer becomes a lot clearer, but in a way also more subjective (one reason why they are not economically valued perhaps). That's when questions such as "what type of world would you like to live in" come up. Which may be at the root of why there is such disagreement about climate change to begin with. Some of you bring up a vexed question about expertise. As a self-selected volunteer in the climate wars, I get a lot of "show me your data" (a line intended to bollux third parties who don't know any better) and my standard response is that I don't try to do my own science, as I am not qualified. The twists and turns used to discredit are fascinating; the one that really gets my attention is when something I've said is twisted to indicate its opposite. "True believers" was an early one which is now applied to "warmers" more often than "deniers". Sometimes it is so specific I know it was my work that was twisted, and I can assume this happens to anyone who makes a point cogent or twistable enough to be used. which went right into the actual physics misused by Lord Monckton. My rusty and incomplete calculus wasn't up to the task, but I slogged through anyway, and the comments were a real study. It was like a slumlord from my distant past who would always answer any letter by return, seeing the writer one and raising them. It's very effective - often the better argument loses because the arguer has better things to do. Back to the point about science and understanding: Why do top scientists in seemingly related fields, such as physics, go so far off the rails (often in their declining years) while amateurs often get the quantities right? I believe it is partly because careful amateurs who take nothing for granted and check references as well as the work itself (insofar as they are able) are more self-aware about limitations, and discount bias more. They are interested in learning rather than asserting. Andy Revkin is a peculiar case. His degree in biology should make him a good amateur, but at some point his excellent work over the decades appears to have made him a self-appointed referee who has left some of his objectivity behind, or perhaps in the pockets of the likes of Dr. Pielke Jr. His honorary Ph.D. from Pace might play into this too, though well earned by his journalism over the decades were it not now being used to in a way that often fails to get the real facts across the glare of the footlights. It's hard to know what to do with the Gaievers, Dysons, Currys, Happers, Akasofus (new one lately), et al., some of whom don't even seem to intend malice. The latest Heartland magazine and list is very professional looking and indistinguishable to the uneducated layperson from the real thing. One could say the extremely profitable lobbying industry has created a shadow world that is all too plausible to a culture obsessed with "virtual reality". Our addiction will feed itself until the whole apparatus shuts down if we don't get wise to ourselves soon. Revkin again gives us false balance. IIRC, MT nailed him for that previously, and he never gave an adequate response. While there may be some valid points to discuss about the distance between diagnosis and treatment, any nits you have to pick about the final paragraph of the responding op-ed are insignificant next to the bald misleading and irresponsible distortions of the original offender. Revkin uses balanced phrases ("Both manifestos illustrate the lure and hazards of arguing from the edges.") that try to make him into the sensible adult chiding both kids for squabbling unfairly. But the responders are smack in the mainstream, not on the edges. Fail. Andy does seem to show some recognition of the problem, albeit indirectly, in a subsequent post that nails the original group for the ridiculous Lysenkoism stuff. He (Revkin) uses strong language here that he doesn't rain down on the responders. So why the oscillation between (ostensibly) prudent balance and flashes of common sense which necessarily entail some opprobrium? I think Andy nurses a fantasy that if he only can establish a nice high-toned forum, he will facilitate some real progress on the congeries of issues he has rightly identified. Alas, the progress is well-nigh invisible in the world at large, and even in his own comment section, which I have stopped reading. Too much Kim and wmar to wade through. "That’s when questions such as “what type of world would you like to live in” come up. Which may be at the root of why there is such disagreement about climate change to begin with." So obvious, but rarely recognized. Thank you. This is why you must fight and win. “Unabated CO2 emissions will very likely cause substantial climate change, with serious consequences." A damnably weak statement at this late date. It seems to me, Bart, that you try to project your personal equability onto reality, somewhat in parallel to what Revkin does. Being wrong about this isn't going to affect your life in any meaningful way, is it? "Past CO2 emissions have already caused substantial harmful climate change, and the consequences will continue to grow in seriousness for many years even if emissions are immediately abated. To the extent they are not, the harmful consequences will grow and become catastrophic in scope." This is just reworded Hansen, of course. But Bart, I would ask you to examine why you have the impulse to make such a weak statement. So he suffers from the Curry delusion? Equal time for Doomsayers, equal weight. There is heating to go from current forcing, add the warming masked by reflecting pollution that will clear very soon after we stop adding CO2. Two degrees would appear certain. We have changed the forcing well over an order of magnitude faster than anything in the paleoclimatic record and yet we expect changes to be slower. But I am not a scientist, and running your finger down a graph is not a rigorous analysis. Not exactly. Revkin admits the problem but focuses on the uncertainty about timing to buy into the Breakthrough techno-pony, then says that even if things are going to be more abrupt it's impossible to get people to respond appropriately, so Breakthrough is the best we can do anyway. He's been positioning himself thusly for years now, way before Dot Earth, the first evidence I'm aware of being the ridiculous sycophantic article (note not post) about the Pielkean "middle." Note how convenient such an analysis is for a journalist. Curry, as you know, basically argues that uncertainty is so large that we can't even say anything bad is likely to happen with climate as a result of BAU. She may be down with the Breakthrough plan for all I know, but afaik doesn't go there much if at all since it's still basically a solution to a problem she argues may not even exist. RN and anyone else interested, this DotEarth post is probably the best access point for the discussion relating to Revkin's "middle ground" article (and includes a link to it). The comments are an interesting read. What is the Heartland magazine/list you're referring to? Wow, thanks for that. Terrific stuff from Dave Roberts and others and some interesting sidelights on Gingrich circa 2007 who has only gone downhill. We have been sliding backwards. 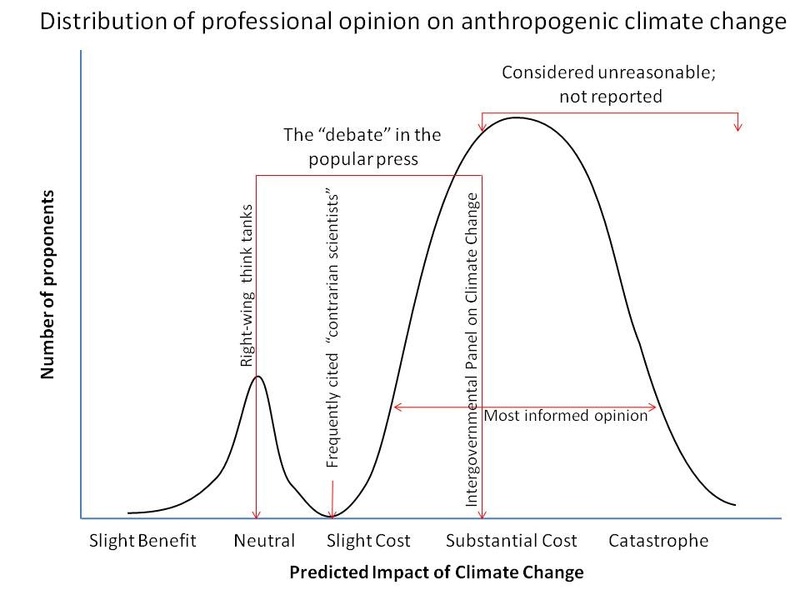 The whole debate in the press is between those who think global warming is a serious, but manageable, problem and those who think it will be no problem at all. Yet there are a number of people, myself included, who think global warming has the potential to be utterly catastrophic. I may well be wrong, but with no attention to our argument, I have no idea where. Those who say no problem are met with detailed response, I get told I am just as bad. (This is not always true, RC did a piece on the likely upper limits of methane release). Science will, in time, fill in the blanks. The error margins will be narrowed. Science will put numbers to what I cannot. But it does seem that as numbers are put in, the picture worsens. My point is; the press debate wholly ignores the possibility it could be worse, or much worse, than currently predicted. The argument in the press is between no problem and not good. Bad and really bad are not in the public's imagination. The Overton window is set between the impossible (no problem) and what is now believed probable. I am not one who thinks catastrophe is already inevitable. But I entirely agree that the public debate unfairly excludes the worse plausible cases and puts absurdly excessive attention into the best plausible cases and then some. Total precipitaton in 2010 highest of the satellite era; 2011 second highest. Both years resulted in various extreme precipitation events, both too much and too little. I suspect this is a foretaste of what is to come in subsequent La Nina years. Not certain it was Heartland (could have been some other organization) but still opine it was them (see below). There is so much awful stuff that is infuriating (anger leads to distortion, which leads to exploitation by nitpickers who are very good at focusing on one small error in an otherwise useful comment) that I try to tune it out. I call myself the fool who steps in where angels fear to tread. The one I regret losing is the alphabetical list of "scientists" ready and willing to help the cause of denial; will keep an eye out for that. What shocked me was the size of the list and its likely effect on an uninformed layperson directed to it. My earlier reference was to two publications online, the slick magazine format and the list of "scientists". The professional production and sciencey rollout is evident in comment sections everywhere, increasingly on real science blogs in addition to the likes of WUWT.